A little over six weeks have passed since I wrote the last blog post on theNorthwest Passage (NWP): Still chock-full of ice. Since that post the NWP was hidden most of the time by clouds, no telling really what was going on down there. In the last couple of days I noticed on the sea ice concentration maps as put out by the University of Bremen that ice concentration in most of the NWP was very low. This has now been confirmed by satellite images. I don’t think it will be declared open officially yet. There is still some ice rubble here and there in Parry Strait and Lancaster Sound, and ice in the Beaufort Sea is still blocking McClure Strait for now. But the rubble will clear and the ice will pull back, making the NWP navigable for the fifth time in six years (previously in 2007, 2008, 2010 and 2011). WIth the Northern Sea Routealmost open as well, we witness yet another summer in which both Arctic sea routes have opened up. This was a very rare occurence in the past, but has already become almost normal in current times. This year’s opening up of the NWP is quite early for the time of year, which is surprising, because the passage was still full of fast ice only one month and a half ago. 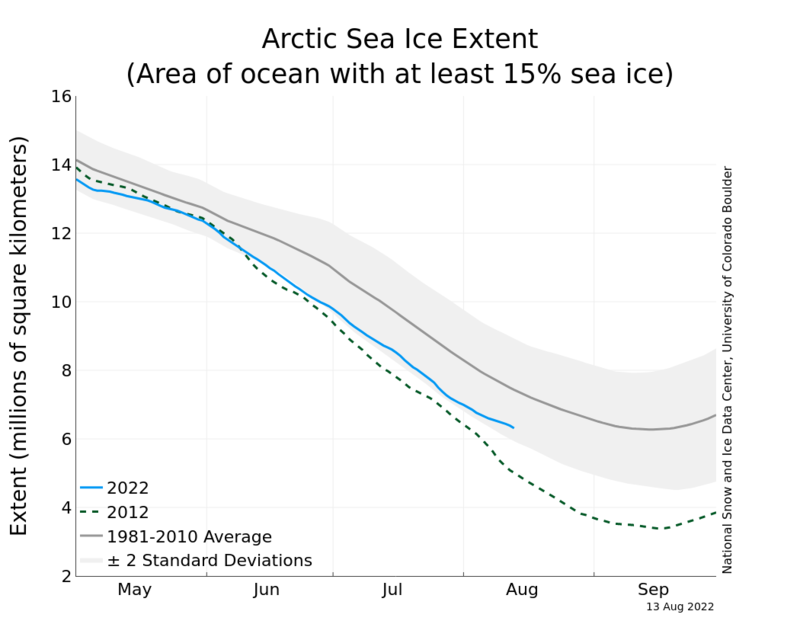 However, as mentioned at the time the concentration of multi-year ice in the region was well below the historical average and although seasonal first-year ice had thickened a bit more than usual because of an anomalously cold winter, it would likely clear during the melt season. Newest in the series I’m producing for The Yale Forum on Climate Change & the Media. I featured the money quote by Exxon-Mobil Chairman Rex Tillerson in my recent video “Welcome to the Rest of Our Lives”. Here’s his whole statement, including the set up question by David Fenton. We know that people in industry have understood the science for a long time. The old “Global Climate Coalition” of the 1990s fell apart as the science became clearer on the human causes. No serious company wants to look like idiots in the face of settled science. In light of this week’s admission by the Oil funded BEST project that climate change is real and humans are causing it, watch for repositioning on the corporate side of the denial camp. Tillerson rolled out this no-doubt focus-grouped response at a recent meeting of the Council on Foreign Relations. Look for this as the template for future climate discussions. We’ve always said it was warming. We’ve always said we were doing it. We’re well briefed on the science. We’re going to keep doing it, so we hope those climate models are wrong. If the models are right, I’m sure the little people will adapt. I’ll be dead, and my kids will be in gated communities at a comfortable latitude. We produce oil/coal/gas because, like Jesus, we love all the little people in all their diversity. In half a million years, it will all be fine. Anyone who hangs around in the comments section of sites covering wind energy knows one thing — clean energy haters love to talk about wind turbine capacity factor. 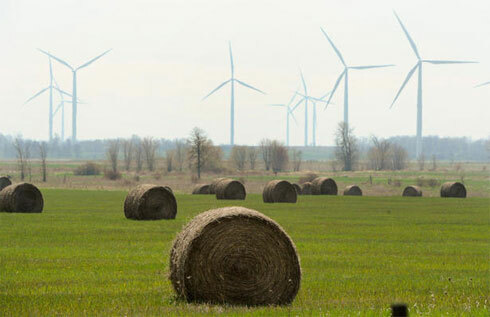 In particular, they love to chant the now quite untrue claim that wind turbines have a capacity factor of 20-30%. If you’re not familiar with capacity factor, it is how much electricity a power plant actually produces compared to how much it would produce if it operated at full nameplate capacity 100% of the time. Where Does Capacity Factor Fit Into Things? Clean energy haters love to talk about capacity factor because it’s clearly a metric wind, solar, and hydro don’t win at (though, geothermal and biopower actually do very well). However, capacity factor by itself is really not that important. What’s important is the total cost of producing electricity. In the energy field, levelized cost of energy (LCOE) is one of the most important metrics. This is “an estimate of total electricity cost including payback of initial investment and operating costs,” as NREL writes. Even without the cost of pollution figured in, if you look at NREL’s LCOE tab, onshore wind energy has a median of $0.05/kWh. The only energy source that beats that is hydropower ($0.03). So, the point is, onshore wind energy is already essentially the cheapest option for new electricity (new hydro is not so cheap — that low figure is based on very old dams), even with NREL’s median capacity factor of 40.35%. Is this hilarious or sad? Don’t get me started on the tyranny of lawns. Ok, well, you did get me started, so here I go. The Staten Island, N.Y., resident and her husband, Ronnie, hired a local entrepreneur to spruce up their yard by spraying it with a deep-green organic dye. By Monday, the couple’s property was aglow with newly green blades of grass and no watering needed to sustain it. With two-thirds of the nation covered by a drought that stretches from coast to coast, residents and businesses in normally well-watered areas are catching on to the lawn-painting practice employed for years in the West and Southwest to give luster to faded turf. 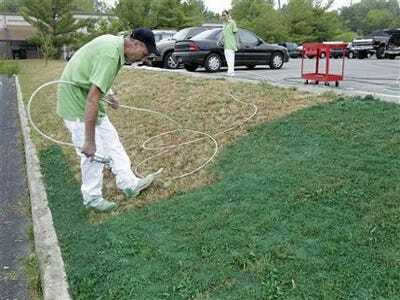 LoPrimo paid $125 to green up her roughly 830-square-foot lawn. She said it was worth every penny to keep her home of 33 years graced by an attractive yard. Of course, there were residents of Southern California who didn’t bother with lawns. They filled their yards with green concrete, gravel, or redwood chips. But these people were about as popular as homeowners who parked pickup trucks in the front yard or kept their Christmas lights up year-round. They had violated the iron rule of lawns, which may be stated as follows: SHORT, GREEN GRASS IS THE ONLY NORMAL, RESPECTABLE THING TO HAVE IN YOUR FRONT YARD . Nancy and Walter Stewart of Potomac, Maryland, discovered this truth in 1986. That was the spring their tractor mower broke down one time too many, and they decided to let most of their seven-acre yard grow. Soon shaggy meadow grasses and wildflowers overtook the lawn. The Stewarts loved the natural look and the low maintenance—twice-a-year mowing and no watering or pesticides. But in their posh Washington, D.C., suburb the meadow garden stuck out like a jalopy up on blocks. The neighbors were furious. One sent an anonymous note calling the yard “a disgrace to the entire neighborhood.” Someone started a fire in it. The county cited the couple under its weed ordinance. After the Stewarts threatened a legal challenge- Nancy is a U.S. Justice Department attorney—the county finally amended its weed law to permit meadow gardens with a mowed strip surrounding them. BEST Official Announcement: Warming Man-Caused. Solar Influence “negligible”. 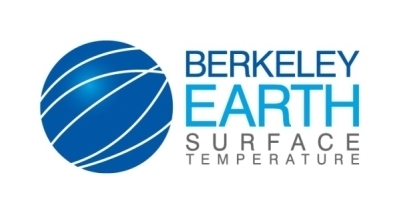 Berkeley Earth has just released new results, showing that the average temperature of the Earth’s land has risen by 1.5 °C over the past 250 years. The good match between the new temperature record and historical carbon dioxide records suggests that the most straightforward explanation for this warming is human greenhouse gas emissions. The new analysis from Berkeley Earth goes all the way back to 1753, about 100 years earlier than previous groups’ analysis. The limited land coverage prior to 1850 results in larger uncertainties in the behavior of the record; despite these, the behavior is significant. Sudden drops in the early temperature record (1750 to 1850) correspond to known volcanic events. In its 2007 report the IPCC concluded only that “most” of the warming of the past 50 years could be attributed to humans. It was possible, according to the IPCC, that increased solar activity could have contributed to warming prior to 1956. Berkeley Earth analyzed about 5 times more station records than were used in previous analyses, and this expanded data base along with its new statistical approach allowed Berkeley Earth to go about 100 years farther back in time than previous studies. By doing so, the Berkeley Earth team was able to conclude that over 250 years, the contribution of solar activity to global warming is negligible. You can access the results here: http://berkeleyearth.org/results-summary/. Berkeley Earth’s data can be accessed here: www.BerkeleyEarth.org/data. We hope to add daily data soon. We have also added a feature to look up data by location (continent, country, state, or city), available here: http://berkeleyearth.lbl.gov/country-list/. In making these results and data accessible to professional and amateur exploration we hope to encourage further analysis. If you have questions or reflections on this work, please contact, info@berkeleyearth.org. We will attempt to address as many inquiries as possible, and look forward to hearing from you.